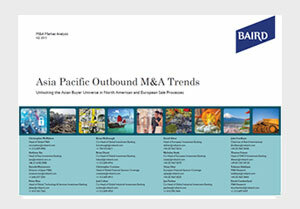 Baird analysed 350 Asia Pacific outbound M&A deals in four key sectors – Industrial, Technology & Services, Consumer and Healthcare – assessing the countries involved, type of buyer / seller, target subsector and valuation. We also evaluated Asia Pacific outbound deal drivers, as well as valuation perspectives, and considerations for Western sellers and Asian buyers in M&A processes. Asian buyers have shown that they can pay premium valuations upfront for quality Western businesses and ‘trophy assets,’ as well as take a long-term view and invest significantly in challenged companies post-acquisition. Baird expects that more successful outbound acquirers from Asia Pacific will emerge and believes that relevant Asian buyers should be included in every North American or European sale process to optimise potential outcomes for sellers. Learn more about Baird’s Global M&A capabilities. To request a copy of the full report, contact Tahs Siddique.